Michaela Glanz is Head of the Art | Research | Support Department at the Academy of Fine Arts Vienna, where she supports and advises arts-based researchers, artists and scientists on project funding and related issues. Michaela is furthermore Head of the Management Board of the Centre for Knowledge Transfer East, a regional cooperation network including all nine Viennese universities, where the Academy is the lead partner for the fields of art, arts-based research, social sciences and humanities. Before joining the Academy in 2012 she was programme manager at Vienna Science and Technology Fund, where she among others developed and ran the funding programme for Social Sciences, Arts and Humanities. 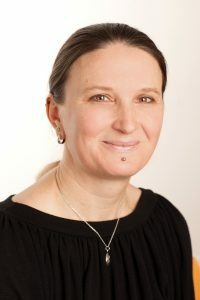 Having been trained as a sociologist and economist, Michaela’s expertise focuses on the fields of higher education research, social studies of sciences and organisational studies as well as questions and methods related to evaluation and impact studies. Michaela has also been involved in a number of European research projects (FP6, FP7, H2020) addressing different aspects and dimensions of impact (and related debates) in research and innovation. Together with colleagues she published a paper on the impact of ERC funding schemes on European universities and their actorhood.